Hello and welcome to my blog; today I am going to share with you a card that I made using the Hello Cupcake Stamp Set which you can earn for free with a $50.00 order for another 10 days. That's right Saleabration is almost over! I know sad face right; So if you want to take advantage of this promotion now is the time to do so I am just saying. Here's a look at my card. Like I said I used the Hello Cupcake stamp set. Which is a great set with the fun cute cupcake and coordinating images. I actually designed this card before the coordinating framelits for Saleabration Coordination came out and have since sold out. I cut each layer out by hand. Yes, you just read that correct I actually did fussy cut each and every piece. 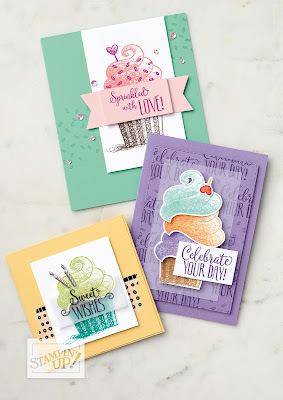 Here's a few cards that Stampin' Up! designed for the Saleabration Brochure. Actually I only had to cut the top there layers of icing and the little heart pick. 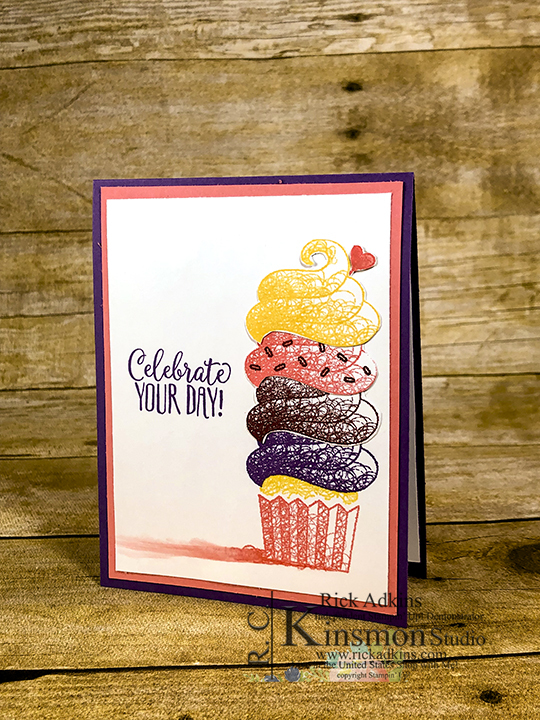 After that I had stamped the cupcake bottom and cake on the whisper white (3 3/4 x 5) card front layer. After the stamping of the bottom layer I added the icing each layer at a time with a little multipurpose liquid glue. I find this adhesive the best for this type of card because you have a little wiggle room to make sure everything lines up perfectly. 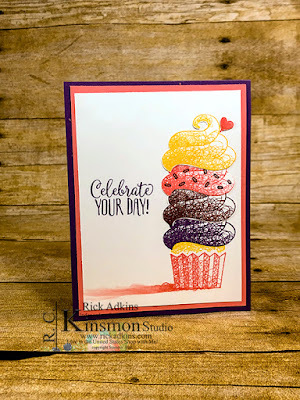 For the inside of the card I stamped the sprinkles from the stamp set in the same colors that I used for the card. Pineapple Punch, Flirty Flamingo, Merry Merlot, and Gorgeous Grape. This is actually a color combination that you wouldn't think about, but looks really good together.